Growers stories are still growing! Our ‘stories’ section is an opportunity to showcase particular listees and give an insight into what’s going on for the people producing your food. Ultimately listees will be able to blog about what’s going on at the farm, farmers’ market, community garden and so on. A box system in Brunswick, Melbourne offering seasonal organic produce. Marcus and Angie run Local Organics. Local Organics started as a CSA collection point for Rod Mays seasonal Organic boxes. ‘In fact we were his first Melbourne delivery, back in 2010. It all started when we visited the country and ate food that tasted amazing. We wanted to experience the same tastes back in Melbourne.’ See full story. 40km from Melbourne. Supplying eggs to the Western Organic and Seddon Organic Coops. “After working away through Christmas & New Year, the Mobile Chook Palace is built, and the hens have entered the building! Using portable electric net to keep predators out and chooks in, we move The Palace every other day, so there’s always fresh green pick and bugs for the hens to chow down. This also breaks the link in the poop-pathogen-cycle, deposits natural fertilizer at balanced concentrations, stimulating the pasture to bounce back, developing full roots and shoots (and bugs) in the lengthy recovery period, before the ladies arrive again. Cruising through the orchard takes advantage of fallen fruit, or in the paddock, fly larvae (protein!) in the cow poops. See more at the Melton blog including photos of the Mobile Chook Palace. Community box scheme, Brunswick and northern suburbs of Melbourne. Blue Sky Organics farmer, Madeline Watts, supplies organic garlic from her farm in East Gippsland that is delivered to over 45 locations throughout Melbourne as part of Fruit and Vegetable box deliveries by the CERES Fair Food network. Busch Organics, in East Gippsland, provides broccoli, cabbage, beetroot, carrots and other seasonal vegetables delivered to over 45 locations throughout Melbourne as part of Fruit and Vegetable box deliveries by the CERES Fair Food network. You can find more fruit and vegie box supplier stories at the CERES Fair Food Vimeo page. Or go to http://www.ceresfairfood.org.au/ for more information on the program. 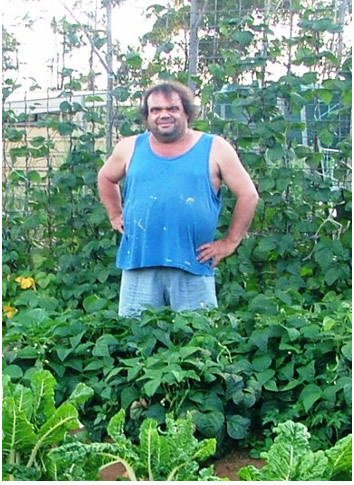 Dave grew up around Japoonvale and has spent much his life growing sugar cane. Even farmers have tree changes, and Dave headed for the hills and has been steadily diversifying his production base. In just a few years Dave has managed to supply most of his own food needs and shares some of his excesses with us. He wants to help our Realfood Network to succeed because he knows that farmers need to connect with those consuming their products. Dave has been selling directly to the public through a roadside stall and appreciates the feedback. 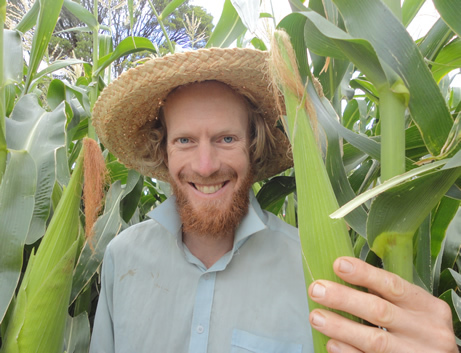 He is constantly broadening his horizons and is now applying compost tea through keyline ploughing and establishing tree corridors using permaculture swales. We are indeed privileged to have his support and incredible produce. More stories of farmers from the Queensland Tablelands at the Real Food Network website. The Bauer family farm is situated in the heart of the Lockyer Valley (one of the top ten most fertile farming areas in the world) and draws its water from a crystal clear underground supply fed by Blackfellow Creek. The Bauer family has farmed here since Rob’s great-grandfather took up a ‘selection’ in 1885. This 363 hectare property, made up of 5 mostly-adjoining farms, grows a wide range of vegetables and is Queensland’s largest producer of certified organic veggies. The farm is owned and managed by Rob Bauer and his son Anthony. Rob is one of the pioneers of the certified organic industry, choosing to grow produce in harmony with nature since the early 1980s. The farm is certified through the Australian Certified Organic system. They grow carrots, potatoes, broccoli, celery, sweet corn, lettuce, cauliflower, tomatoes, bans, pumpkins and melons. More stories of the hard-working farmers supplying Food Connect at the Food Connect website. One Farm Day is a blog of farming stories written by Sophie Hansen, food writer, blogger and deer farmer at Mandagery Creek Venison. The project is in recognition of both Australian Year of the Farmer and National Year of Reading through the NSW Department of Primary Industries writer in residence program. 52 Farming Stories in 52 Weeks tells the story of a different farmer every week for a year. Fleur McDonald is a farmer and author based in Western Australia who is widely known as the voice of the outback. With a significant city-based readership from her novels, Fleur’s blog connects an urban audience to farming realities and also dispelling some myths. The Sunshine Coast Regional Food Local Harvest website (separate but just as interesting!) has blog stories about local food producers. We’re looking for people to regularly (or irregularly) post about their experiences with growing, harvesting and consuming local food.